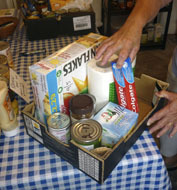 Knighton Food bank provides emergency food parcels for people experiencing a crisis situation. All volunteers report to the manager, Helen Anderson. To offer support and a listening ear to all who use the Knighton Food Bank. To act in a non-judgmental, welcoming manner to clients, maintaining their dignity and independence. 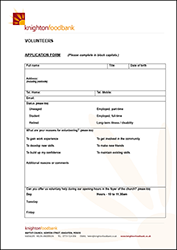 To participate in training, support and supervision sessions as appropriate to the role of Food bank Helper. Minimum of 1.5 hours per month, as agreed with food bank Manager. Volunteers should notify the Manager at the earliest opportunity in the event of not being able to attend, e.g. Sickness.